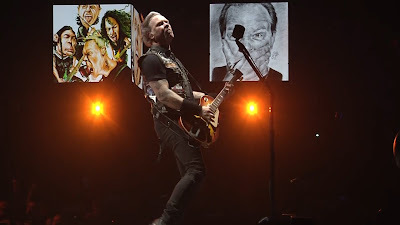 Metallica are streaming live video of their 1983 track, “Phantom Lord”, from a January 30 concert at the US Bank Arena in Cincinnati, OH. It’s only the second time in five years that the song has appeared in the band’s setlist, after it surfaced last fall in Philadelphia, PA as part their current North American tour, which wraps up next month. Metallica’s album debut, “Kill ‘Em All”, didn’t arrive on the US Billboard 200 chart until three years after its release, where it peaked at No. 66 on its way to eventually selling 3 million copies Stateside. Major League Baseball’s San Francisco Giants recently announced that they will host the 7th annual Metallica Night at AT&T Park on April 26. Tickets are now on sale with full event details at mlb.com.